In this four-part series learn how to test your React / Redux applications using both Jest and Enzyme for a robust testing solution. This series focuses on testing and assumes you have React / Redux knowledge. Leverage Default Behavior: By default Jest looks for tests in the __tests__ folder. Folder Hierarchy: Mirror your src folder hierarchy for easier test management. Separate By Type: Keep separate folders for components, actions and reducers. Append Filenames: For files containing tests use the .test.js extension to differentiate. You can also use the .spec.js extension in place of .test.js. I prefer the latter. In your Terminal cd to the root of the React / Redux application you want to test. Then run one of the following commands depending on whether you use Yarn or npm to install Jest as a dev dependency. Let’s install Enzyme which requires a couple of peer dependencies to easily integrate with Jest. The following command assumes you're using React 16. If you're using a different version then make sure to install the Enzyme adapter for the version you're using. There is a small amount of boilerplate code needed to integrate Enzyme with Jest and React. Let’s go ahead and install some libraries to assist us with mocking our Redux store. Creating aliases via npm scripts allows you to keep a common interface for running tests among your projects which may have different flags an parameters being used. Keeping your tests organized into suites is very easy with Jest and describe(). This makes it a bit easier to maintain your tests. You will also see the organization represented in the test results output. 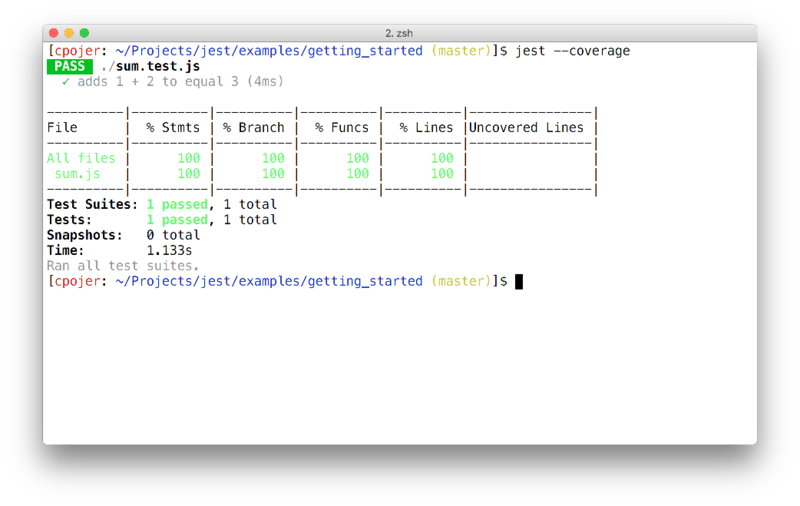 With Jest you can generate coverage reports by adding the --coverage flag to your test running scripts. That’s all there is to it! Jest offers a great feature called Snapshot Testing. If you’re not familiar with what it is, you can read this following post or ours: Introduction to Snapshot Testing With Jest. Snapshots are ideal for testing things that you don’t expect to change or don’t want to change in the future. Snapshots provide a form of regression testing. We’ll use them to test components, actions and reducers and ensure they only change when we want them too. Don’t use Snapshots when you know that something will be different every time you run the test or when you first start writing a new component, action or reducer. Example 1: You have a utility function that returns a random string. You cannot test this with Snapshots as it will be different each time. Instead, I recommend testing that the string is the proper length and made up of the correct types of characters based on the type of string being generated. Example 2: You just started writing a new component and are writing tests as you go. I recommend avoiding Snapshots at first. Instead polish the component and get it close to what you know it will be. Then switch over to using Snapshots. For some examples of writing asynchronous tests see the Asynchronous Tests in Jest post. In Part 2 of this series I’ll be covering how to test React components. In Part 3 we’ll move on to testing Redux actions. We’ll finish up in Part 4 where I’ll show you how to test Redux reducers. Stay tuned!